34 bulls are doing a lot better now that they’ve been released from a horrible transport truck and are safely in the care of Blue Cross. These magnificent animals wander peacefully in the sunlight of a courtyard, with tall trees all around. They’ve been eating hay and lots of nutritious food, and are recovering from their ordeal of three days without food or water, crammed into a tiny truck. One is still resting with an injured hip, but he is improving. Another bull is feeling lively enough to defend his turf, nudging others away from the food trough. In the middle of the night, on February 1, Dawn Williams, Blue Cross Resident Shelter Manager, received a call from an alert traveler who had spotted a transport truck, crammed with bulls, on the highway. Transport of cattle is not illegal, but overcrowding is, and Mr. Prasad made a quick call to Blue Cross that saved the 34 bulls. Dawn Williams, who has rescued thousands of animals, accompanied by IIT graduate student Raghav Venkatesan, rushed to the town of Tambaram, south of Chennai, where he managed, still in the middle of the night, to lodge a complaint with the police, and get the truck intercepted on the road, after a police chase. With the truck pulled over, he climbed up onto the top to take photos, recording the dreadful conditions in which the bulls were being transported, with 34 bulls in a space big enough to carry legally only six. Large numbers painted on the foreheads of the bulls indicated where they had originated. Number 14 meant they had come from Orissa, and had already been traveling for three days. As well as having no food or water, they had no protection from the sun, and they were all in a very bad condition. 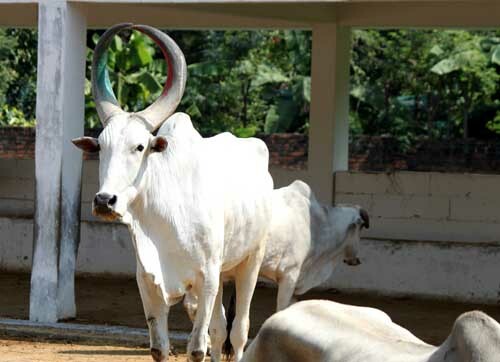 The truck driver, Balasubramaniam, was arrested, and the bulls were saved from another 36 hours of suffering, since they had been on their way to Kerala. One of the policemen on duty at Tambaram Police Station had been among the 300 or so law-officers who had attended a three-hour sensitivity training workshop, given by the educators of Blue Cross and the Animal Welfare Board of India at the Chennai Police Headquarters, as arranged by Mr. J. K. Tripathy, Commissioner of Police. The police officer filed a complaint (a First Information Report or FIR) charging violations of the Prevention of Cruelty to Animals Act, the Transportation Rules and the Indian Penal Code. The driver is still in jail. Most importantly, the police have seized the truck and are tracking down the person who hired the truck, as well as the destination, which was apparently a butcher in Kerala. Slaughter of cattle is legal in the state of Kerala; though it is banned in nearly all other states in India. However, illegal transportation of cattle that are destined for slaughter once they reach Kerala is a major, ongoing issue. Overcrowding and extremely abusive conditions are common. Halting this shipment of cattle will reinforce the message that illegal transport of cattle is both illegal and inhumane. This truck was just one of over a thousand which cross the Tamil Nadu/Kerala border every single week – each carrying up to 40 head of cattle. 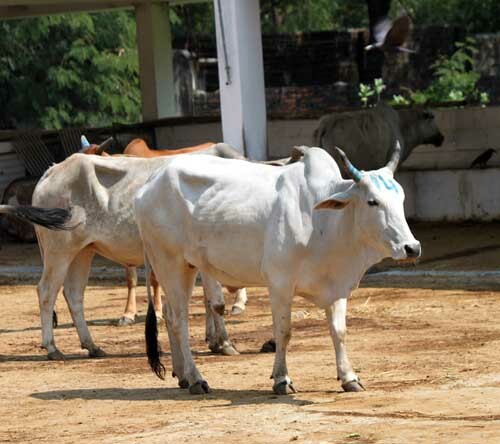 Kerala is one of only two states, along with West Bengal, where cow slaughter is permitted. 1. Report to the police, in writing, every case of such illegal transport you see. If an FIR (First Information Report) is not filed by the police in response, write to your Director General of Police. 2. Write to the papers reporting each case you see. 3. Support your local animal welfare group – think All-India; act locally. If there is no group, form one with others who care. Ensure that you note down the registration number of the vehicle. Since most people today have camera phones, take photos. A picture is worth well over a thousand words. Today bulls are no longer valued in India, as they were in the past. With the advent of artificial fertilizer, which is neither natural nor healthy, there is no longer any need for manure to be used as a fertilizer. In Indian villages, there was traditionally a cow-herding community, who made their income by grazing cattle. When someone had a plot of land on which they grew crops, they would pay the people who owned cows and bulls to come graze the cattle on the land, leaving manure behind and fertilizing the land as they grazed. Without this useful function, bulls and male calves no longer seem as useful or as valued as before. Written with information contributed by S. Chinny Krishna and Dawn Williams. I was traveling from thekkady to kumarakom. I was unfortunate enough to see a few trucks on my way near mundakayam district, carrying large no. Of Cows loaded in these trucks. They were clearly uncomfortable the way they were packed like non living things. I have also clicked a pic of the truck. Please tell me where I can post these pics so that some justice cud be done to these poor cows. Thanks. Thank you for caring about the cows. You need to contact Blue Cross of India in Chennai. Please contact them; they have helped hundreds of cows, and they will be able to advise you. Again, thank you for caring about the animals. Blue Cross of India has been trying to reach you to see about helping with the situation of the cattle being transported, but we do not have a current email address or a way to reach you. They can help by letting you know what action can be taken. Could you please write to dawn@bluecrossofindia.org? Thanks so much. Perseverence in stopping this illegal transport via Tamil Nadu MUST go on- if only Kerala could refuse accepting them! We have to put an end to this at any cost- hurdles there will be, but we must not give up!